DBRC and its members work together to provide efficient response solutions in case of oil spill emergencies in the Delaware Bay and River. Below, please find information about all of the available equipment and resources available to the DBRC. Click on the links below learn more about DBRC`s emergency response equipment and to view DBRC`s Oil Spill Activation Plan. Below is a list of the DBRC equipment storage locations throughout the Delaware Bay and River. Boom is stored at various locations to maximize response capabilities and increase response time. 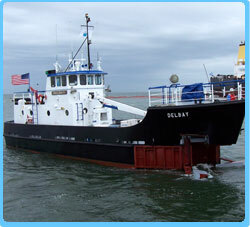 DBRC`s fleet is capable of deployment and recovery of boom throughout the Delaware Bay and River. In case of emergency spill, DBRC deploys its fleet as well as any other protective measures necessary for emergency cleanup operations. For more information on becoming a member of the Delaware Bay and River Cooperative, please visit our Membership section of the site. Read more about DBRC's Emergency Response Equipment.